My new favorite holiday cookies. Go to Target, walk back to the holiday baking section. Buy every single pouch of Betty Crocker snickerdoodle mix that they have. Trust me. It is the unicorn of cookie mixes. Difficult to find, but so magical when you do. Set aside cinnamon sugar packet. Add water, egg and cookie mix to cream cheese mixture. Cover & refrigerate 30 minutes. After that horrible 30 minutes is over, drop rounded spoonfuls of dough into cinnamon sugar. Bake a 375º for 8-9 minutes until edges are set. Cool one minute then transfer to cooling rack. Cool completely then gobble them up. Or share them with your neighbors and friends. Totally up to you. But I won't judge you if you don't. Because it is super hard. They are way too good. *When I run out of my snickerdoodle stockpile I am going to try making these with the easier to obtain sugar cookie mix and cinnamon sugar. I'll let you know how they compare. That might be the best recipe intro EVER! You actually made me want to run to Target and get the mix. Hopefully ours will have it... if not I'll try Wally World. Ok, I hit 2 Target's today and no snickerdoodle cookie mix. Now I'll be driving all over Pennsylvania looking for this darn cookie mix! Maybe it's only sold in Cali? 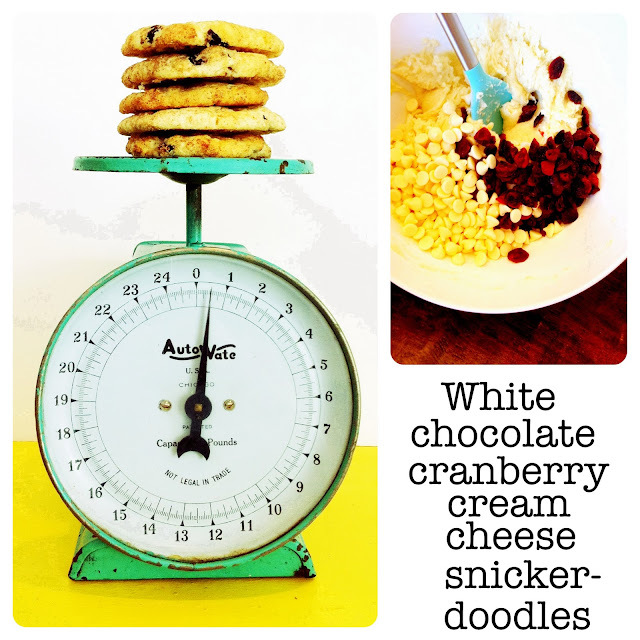 Christmas cookie exchange in 2 weeks, must find this cookie mix!! You had me at "White Chocolate Cranberry" but then you said "cream cheese" and "snickerdoodle" and I really started drooling, LOL! I sure hope I can find the cookie mix - these sound delicious! Thanks for sharing! there's a lot of yum in the title! It is NOT on the regular food aisle. It is with the Christmas food aisle! Hi Julie! GREAT recipe! Last batch is in the oven now. In case others are curious ... my dough was super sticky, but once I rolled in the cinnamon sugar, I was able to make more of a ball shape. Also, I always "squish" down my snickerdoodles with the bottom of a glass. I did this with these, too. Otherwise, mine always end up poofy and not flat. Thanks for yet another DELICIOUS and SIMPLE recipe! I made a batch of these today, and in true joy's hope style, I delivered them to our friends who just bought a new house! We joined them in praying over their new place and then toasted with delicious cookies. Everyone who tasted them LOVED these cookies. A definite keeper. Thanks! I think you need to add some walnuts or macademia!!! YUM! Gymnastics bake sale here we come! I just got the ing. to make these today. It is cold and rainy (that does not happen here in Phx very often) so it is the perfect day to make these cookies:) Anyway, i just wanted to let everyone know that the snickerdoodle mix was in the regular baking area in my Target...not the holiday section. So, make sure and check both areas. Thanks for the wonderful recipe. And, your whole blog :) Extra smiles in my day when there's a blog update in my email inbox. thanks so much for the recipe! now, back to target i go!! Bought the ingredients a few days ago in OKC...regular baking aisle at Target. Made them tonight and they are wonderful!! Fresh out of the oven, they are almost like a little pie! I doubled the recipe to take some to my son's preschool class for his two year old bday. Glad I doubled...we'll be eating on these for the next few days! Thanks for sharing!!!!! mmmm, about to make these. i really did buy every last package of snicker doodle mix at target, just like you told us to :) can't wait to try them! they are in the oven!!!!!!!!!!! so......i made these last night. THANK YOU! THANK YOU! THANK YOU! they are amazing!i MUST now go to target and buy EVERY snickerdoodle mix they have. not sure why i didn't listen the first time. FINALLY made these last night to share with co-workers. My word, they did not disappoint! In fact, a few were speechless and that's something I've never seen before. This recipe is for sure a keeper. Thanks for sharing Julie! I made these for an open house for our church...I've since given out the recipe five times. They were a hit...and my one year old stole at least three of them over the weekend. these are COOKIE CRACK. i am not kidding! they may even get my to blog again. i've been making them weekly since my mom passed using the sugar cookie mix, orange cranberries (the tj ones) and white chocolate chip. i've skipped the rolling in sugar a few times out of complete laziness and every time, no matter what, they are FANTASTIC! even the dough is delicious. happy wednesday, julie! My favorite cookies ever. i sub dried cherries for the cranberries. yum! They are fabulous and apparently snickerdoodles are for Christmas so the mix is only 63 cents right now at Target. Yay! You've done it again, simple but so stinkin cute. My kid told me the other day he'd really likes cookies better than cupcakes. I know you wrote this about a million years ago, but I'm making these right now. I read this post way back when and I've never been able to get these cookies out of the back of my mind.